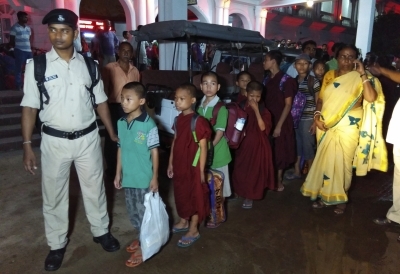 Agartala Sep 15 (IANS) A group of 18 girls who were rescued by the Bihar Police from a Buddhist School and Meditation Centre in Bodh Gaya have reached here an official said on Saturday. According to the police the girls aged between 12 to 14 years were sent to the school by their parents six months ago. "The Bihar police last month rescued a large number of children including these 18 girls from the school after parents complained of mistreatment by a monk " the official told the media. The Bihar police earlier this week handed over the children to a team of Tripura Police. These girls reached here on Friday night Tripura Child Rights Commission Chairperson Nilima Ghosh told IANS. Tripura Health and Family Welfare Minister Sudip Roy Barman who along with Ghosh received the girls at the Agartala railway station said that the girls were sent without any information or permission of the state government. Barman said the Tripura government would take up the matter with the Bihar government and the state police jointly with Bihar Police would probe the matter. Among the 18 children 15 are from Tripura two from Arunachal Pradesh and one from neighbouring Assam. Ghosh said that the girls now under the care of an NGO - Child Line - would be sent back to their homes soon.